The St. Petersburg/Gibbs Campus is dedicated to offering excellence in education by providing a variety of academic programs, events and partnerships to better serve our community. Student ID badges are processed in Learning Support Commons (TE 200) and Registration Center (AD 160). Join us every Friday night at 7pm and 8:15pm for a free planetarium show. 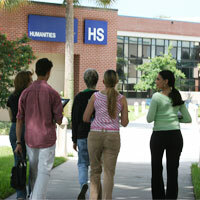 The St. Petersburg/Gibbs campus offers a variety of dance and music programs and events. Live a well balanced life- learn more by visiting our campus Wellness Center.